Some couples worry about the possibility that it might rain on their wedding day, and that it will mean they won’t have the best wedding photos in the rain. Whilst is it normal to be nervous on your wedding day, time has taught me that some on the most original and beautiful, yes I said beautiful, moments are captured in the elements. We live in England after all. Let’s face it, even in the summer the weather in London is not guaranteed. So it’s better to embrace the weather. I also tell people that in some countries rain on your wedding day is a sign of prosperity and good fortune. So nothing to fear! With a little preparation the results can be more than amazing. After 11 years of photographing weddings in England, here are my top tips to put your worries aside about not having beautiful wedding photographs on a rainy day. 1. 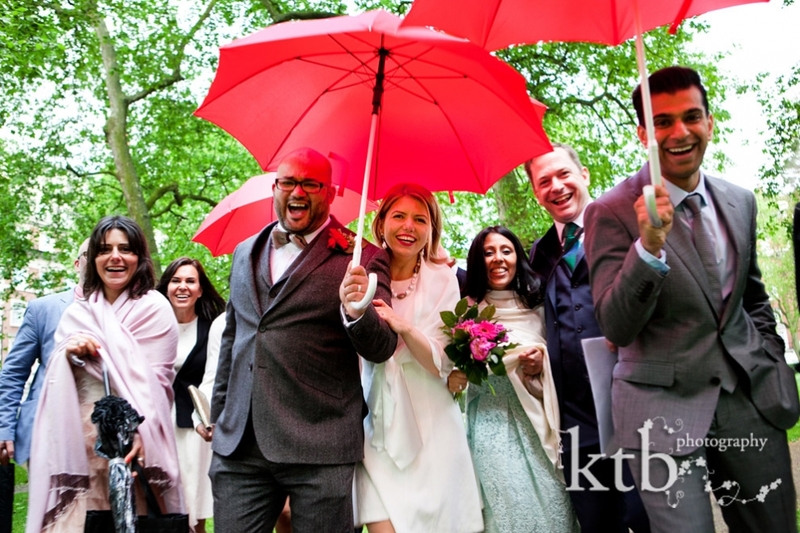 Bring your brolly: A stolen kiss under a shared umbrella, a back portrait of the bridal couple walking on the rain… Or even, your bridesmaids and you dancing on the rain under transparent umbrellas. Umbrellas make brilliant prompts for wedding days. If there is a chance of rain, don’t hesitate, ask a friend or family member to bring a few umbrellas along. Bright colours look great, or just have a smart white or clear if you’re more understated. 2. The light on cloudy (including rainy) days is the most flattering: Clouds are like huge soft boxes which diffuse the light and make for a beautiful, gentle light for bridal photographs. There will be no harsh light which shows every imperfection on your skin, makes your face shiny and eye squinty or gives you black shadows. Its nature’s version of a soft box for glowing skin. 3. You don’t need much for beautiful photos – a simple beautiful spot works rain or shine: In this photo it had just begun to rain, and the bride was running late for her reception, so we used the simple backdrop of a colourful door for the couple photos. You know what, the photos couldn’t have been more beautiful! This photo was on the cover “Your London Wedding” magazine. 4. A good photograph can doesn’t necessarily show it was raining: The photos below were taken in the rain. Can you tell? I didn’t think so. 5. Rain is romantic: What romance story doesn’t have the couple snuggling close together because of rain? Its the English version of hygge – cuddle up under the umbrella. 6. Remember, it hardly ever rains all day: Even with the worst of weather, it hardly ever rains every minute of the day. I only need 5-10 minutes outdoors for a few cracking photos of the bride and groom, and we can nab those during a dry moment at any time during your day. Just be willing to rush out for a few minutes at a moment’s notice. This photo was taken an a mostly rainy day. We rushed out for a few photos when the downpour stopped. 7. Add a splash of colour on your bridal shoes: If there is any chance that they might get wet and dirty, swap your white Jimmy Choos for a pair of bright, red or golden ones. Nothing beats the pictures of these natural moments, when the bride lifts her dress up to her knees in an effort to avoid the rain… revealing the most fantastic shoes she has ever worn. 8. Welly boots: For the most intrepid, or these who simply loved splashing in puddles during childhood; Why not wear your welly boots? If you are getting married outdoors, having a countryside or barn wedding, they look fantastic. My favourite rain photos involve clear umbrellas and the bright and groom on bright and colourful wellies. You can also just pop them on for a few outdoor portraits. I even have been known to bring my own pair of wellies for brides at country house weddings. See the purple polka dot ones in the photo? Yes, they are mine – size 5 if you want to borrow them, too. No matter the weather, I will make sure that you get to keep the best moments of your wedding in pictures. Your images might capture the bright outdoors, the fun in the rain or these intimate indoor moments, but they will make good memories in all cases. 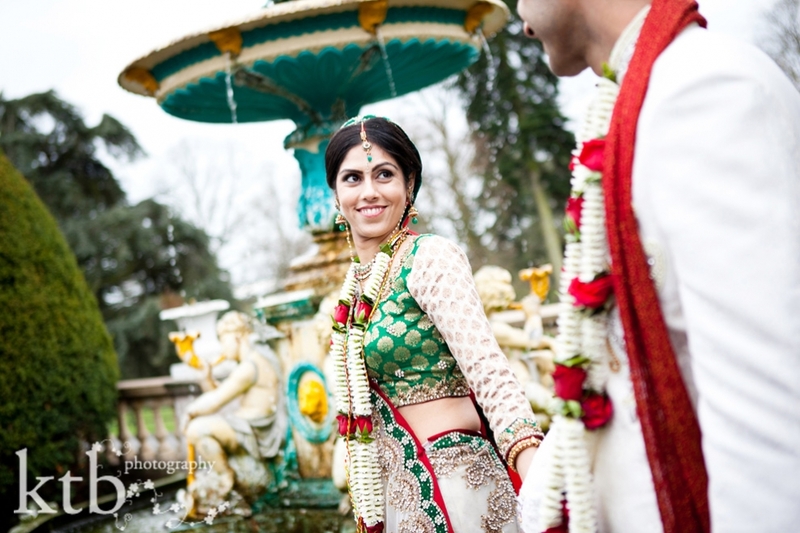 Getting great wedding photographs on a rainy day is nothing to worry about.